If you have dry eyes, of course you want to know what you can do about them. The first thing you should understand is that not all cases of dry eyes can be completely cured. However, even for those cases that can’t be completely cured, there are things we can do to reduce the pain and irritation, and improve your vision. Dr. Leonard has decades of experience helping patients customize their dry eyes treatments to quickly minimize pain and aggravation. Dry eyes can be caused by a number of different things, so the appropriate treatment can vary depending on what your Optometrist determines the problem may be. For immediate relief, you can buy “artificial tears” at your local drug store. These are specially designed lubricating eye drops that should ease the pain of dry eyes immediately, although the relief may only be temporary. There is also a prescription medication called Restasis which can ease dry eyes by producing more tears. 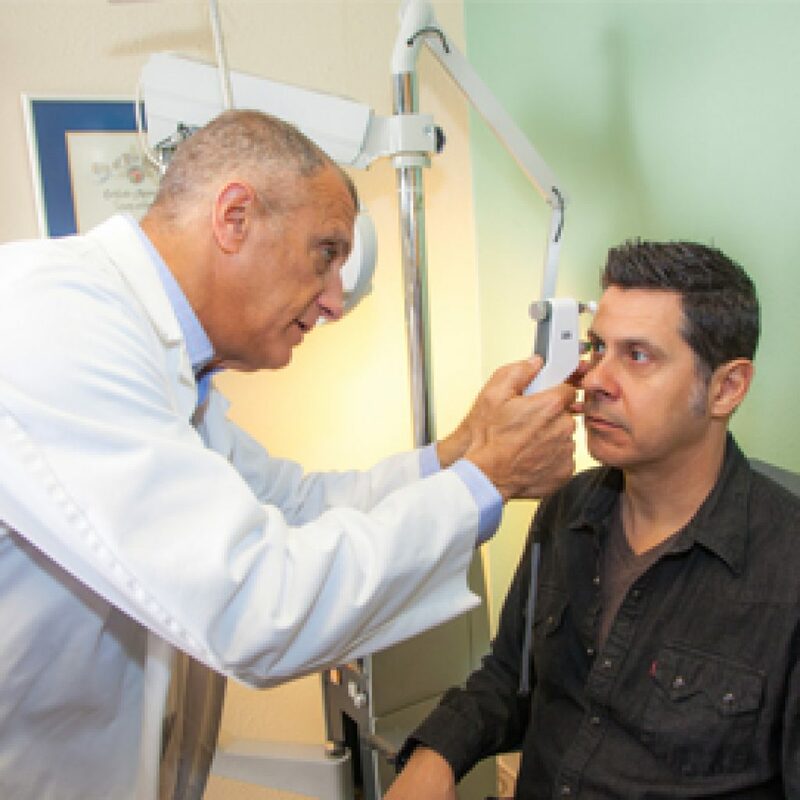 Dry eyes are a common problem for patients in the Valley. Dr. Leonard takes the time to complete a thorough, non-invasive eye exam to better understand evey patient's unique case. To reduce pain in the short term, you should also drink plenty of water to stay hydrated. Using a humidifier in your room can also help to keep your eyes from drying out. Also appropriate nutritional supplements can be a benefit. Wearing sunglasses outside will cut back on the pain from glare. Review any prescription medications you are taking to see if their side effects may include dry eyes. Finally, be careful using “redness reducing” eye drops. They may feel better for a while, but if you keep using them, your eyes will become accustomed to them and try to compensate. This only makes the problem worse. If this advice doesn’t provide long-term relief, more advanced dry eyes treatments are available. There is a device called “Lacrisert” which your doctor can insert inside your lower eyelid. It releases a lubricant over time to help your eyes. Once you get used to it, you won’t even know it’s there. It will need to be replaced by your doctor every so often. There is also a temporary artificial plug that a doctor can place in the punctal duct, which is the “drain” for your eyes. You don’t have to worry about pain or discomfort — when these procedures are performed by an experienced Optometrist like Dr. Barry Leonard, the procedure is painless. The only sign you’ll have that anything has been done is your eyes feeling like new again. If you’re tired of having dry eye syndrome, then maybe it’s time to give Dr. Barry Leonard a call. You can call the office 818-891-6711 to make an appointment, or use the online appointment system at any time — even after hours.